Phymaspermum leptophyllum (DC.) Benth. & Hook. ex B.D.Jacks. A range-restricted Little Karoo endemic (EOO 3771 km²), that is still fairly common, occurring at 10-15 locations. It is declining due to ongoing habitat loss and degradation. Quartz outcrops and gentle loamy lower slopes in succulent karoo and renosterveld. Threatened by ongoing habitat loss to orchard and vineyard expansion around Barrydale. Elsewhere it is predominantly threatened by overgrazing - this species is palatable and heavily browsed. This species has several localized subpopulations, and can be locally abundant in suitable habitat (Vlok and Schutte-Vlok 2010). Ruiters, A.K., Tilney, P.M., Van Wyk, B.E. and Magee, A.R. 2016. 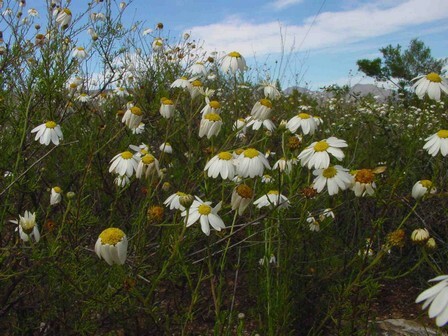 Taxonomy of the Genus Phymaspermum (Asteraceae, Anthemideae). Systematic Botany 41(2):430-456.